Lutheran Men in Mission is a national organization of the Evangelical Lutheran Church of America (ELCA). Its mission is to strengthen men’s Christian faith, relationships, and mission in their homes, churches, and community. 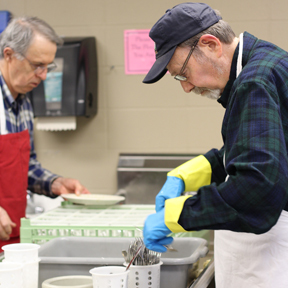 The men hold golf tournaments, work the parking lot during Washington Pavilion events, wash dishes at First Lutheran events, and take part in quarterly meetings. They also support First Lutheran through the Volunteer Shop—a fully equipped woodworking shop at the church—where they create furniture and other items. The men raise funds for their supplies by creating beautiful wood products that are sold at the annual fall Bazaar and by contacting the guys in the shop directly. Men of all ages and stages are welcome. Explore the books of the Bible. Coffee and rolls are available. All men are welcome. For more information about Lutheran Men in Mission, contact Orrin Anderson at (605) 332-5957.